Do you think that God’s love is better than life? Do you really believe so? Perhaps you do, now, because life is good and smooth and very much blessed. But what about in darker times? In trying times? Psalm 63 is a psalm of David during his time spent in the deserts of Judah – namely, the period of time when he fled into the desert due to the rebellion of his son Absolam. Even in his suffering, Psalm 63 showed us how David never failed to pursue God, praise God, and petition to God. Why? How can he still praise God when everything had seemingly fallen out of place, and his very life in danger from his own son? In this study, we will examine how God’s love is so great that it far outweighs our troubles and sorrows and enables us to praise God no matter our circumstances. 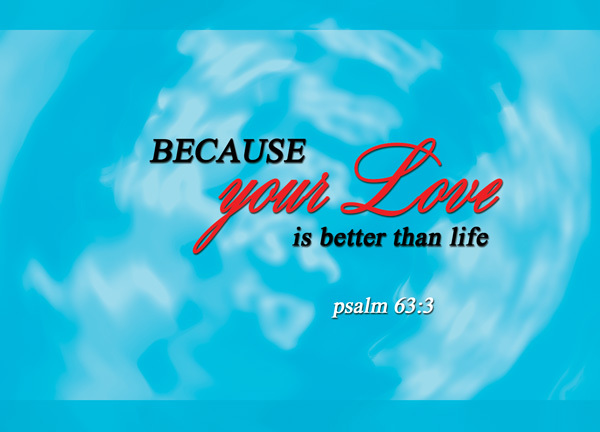 Because – If we referring to the verse prior to this – I have seen you in the sanctuary and beheld your power and your glory [Psalm 63:2], it would mean that God’s power and glory was beheld because his love is better than life. Yet I feel more comfortable in associating the reason with the next phrase; in other words, my lips will glorify you because your love is better than life. Makes more sense, doesn’t it, that we will praise and glorify God for his love alone is greater than life. Even if we choose to read it the first way, it would work too – God is great enough, indeed. your love – cross-referencing other translations, most versions do not simply render the term love as love. Most versions have an additional adjective to God’s love. ESV renders steadfast love; NLT renders unfailing love; NASB, ASV and KJV renders it as loving kindness. Whichever version you prefer, I think the message is clear – we’re talking about God’s love, not Man’s love. This is a love that is more special and far greater than the love that we are used to between mortals. The love of God has been described with plenty of adjectives throughout the Bible, and it will do us much good to remember them whenever we ponder about God’s love. is better than life – At the beginning of the Song of Solomon you’ll find a verse in a similar mould, albeit more poetic and sensual (in my opinion) – Let him kiss me with the kisses of his mouth – for your love is more delightful than wine [Song 1:2|Article]. More delightful than wine! Add to that better than life, which is honestly on a far larger scale than wine, and really, you cannot say that of anybody other than God. You cannot say that of anybody’s love, save for God. only Him. What is life? In saying that it is better than life, we are assuming that life is a very good thing, and few (or none) other things are better than it is. While we may seldom think about it, it may just very well be true. It is in this life that we laugh, we enjoy, we play, we relax, we prosper. It is through life that we know God, we learn about God’s words, we receive our blessings, and we witness the miracles of God. There are bad moments, of course, so many of them, but while the experience at that moment may not have been pleasant, in retrospect we might have found ourselves glad to have experienced them, for various reasons. Life is good – even if your circumstances weren’t always good, even if your health wasn’t always good, even if you never achieved your life goal. Life is good. Perhaps Life itself is the second biggest blessing that God has given us – the biggest being salvation and eternal life. And when it was said that God’s love is better than life, it means several things. It could mean the sheer magnitude of God’s love, since life is big – very big, the biggest thing we can feel. Yes, the universe is big, but also far away. Life is something we live out. We can’t not feel it. It could also mean that God’s love is a bigger blessing to us than life is. Life without the love of God is perhaps worse than death – well most won’t agree with me, so take it metaphorically, yeah. God’s love outlasts life, and death cannot separate us from the love of God – death or anything at all – For I am convinced that neither death nor life, neither angels nor demons, neither the present nor the future, nor any powers, neither height nor depth, nor anything else in all creation, will be able to separate us from the love of God that is in Christ Jesus our Lord [Rom 8:38-39|Article]. my lips will glorify you – our lips will praise the Lord. And why should we, really? If God’s love is indeed better than life, we have no reason not to praise the Lord for that great and perfect love of his. At the end of your life, no matter the regrets that you have, no matter the mistakes that you’ve made, you’re likely to feel blessed to have had the opportunity to live through life, through the good times and the bad. If you disagree with me, I can only pray that when your turn comes, you will have changed your mind. Life – in general – is good, regardless of your circumstances. It’s good to have lived. But as Christians, it must be important for us to acknowledge that life is much better because we enjoy God’s unconditional love. God’s love is better than life. And because it is, we have an unchanging reason to praise God.